Cumhuriyet: Pepper spray has left him mute! During the Gezi resistance Mehmet Istif (36) was sprayed into his face with pepper gas causing severe injuries to the inside of his mouth. These injuries have been treated for the past month. Istif, who has lost one fourth of his tongue and has difficulties in speaking, said, “I will apply to the judiciary for the identification of the chemical in the pepper spray and ask for pepper spray to be banned from use”. During the Mediterranean Games opening ceremony on June 20, Mustafa Istif was participating in a protest in Gazi Mustafa Kemal Boulevard (Mersin) where the police sprayed him with pepper spray at close range. After being exposed to the gas, he felt severe burning in the mouth and nose. Since other people have had similar symptoms he thought that it would pass with time. However, the next day his mouth started to swell and open wounds started to appear in his mouth. Only after that he sought medical help at Toros Government Hospital where they examined his mouth and erroneously diagnosed his wounds as an infectious disease and prescribed antiseptic sprays. As a result of this incorrect diagnosis his wounds became worse and he was admitted to Mersin University School of Medicine Research Hospital a few days later. After his first examination at the Forensic Medicine department, physicians stated that the wounds were thought to be caused by pepper spray and he was forwarded to the ENT clinic. There he was diagnosed with an “allergic reaction” and was operated on another ten days after. During the operation the mucus layer formed on his tongue was cleaned and a quarter of Istif’s tongue had to be removed due to the gangrene that had develpoed. Although Istif’s treatment at Mersin University School of Medicine Research Hospital lasted several days more, his wounds were not totally healed. Biopsy samples from his wounded tongue have been sent for further examination. “ They operated on me since the wounds have been spreading to my whole mouth. A mucus layer was formed on my tongue due to the wounds. They removed it and yet I lost one fourth of my tongue as a result. They diagnosed me with an allergic reaction yet the substance could not be identified. I had not had any medical problems until June 20. They told me to stay in the hospital for a while longer. Recently I have had severe pain in my mouth. The infection has not been halted and I still have a high fever. I cannot talk.” Istif said. Ali Tanriverdi, president of Human Rights Association (IHD) Mersin Branch, emphasized that many people lost their lives due to the improper use of pepper spray and tear gas. “Pepper spray has recently caught public attention due to the Gezi protests yet we have been experiencing similar allegations for many years in Mersin. Especially in Kurdish neighborhoods, many have been injured or paralyzed due to the improper use of pepper spray or tear gas. They have even thrown gas canisters into houses. Mersin was selected as a pilot region for tear gas trials and after being successful there, they have started to use it nationwide. We have applied for a ban on the use of tear gas and pepper spray yet the government has spread the use all around the city. The use of tear gas and pepper spray is a direct violation of human rights,” he added. 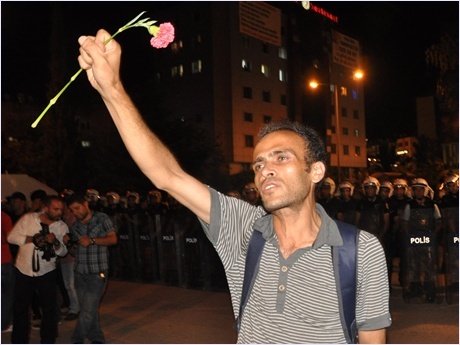 This entry was posted in Accounts of violence, News, Personal stories and tagged Human Rights Foundation of Turkey, Mediterranean Games, Mehmet İstif, Mersin, pepper spray, Police brutality on 3 August 2013 .